High energy hillbilly/rockabilly CD with a touch of spaghetti western. “Hot enough to raise sweat on a chunk of granite!” - Monday Magazine. “There’s always a few guitar players in any scene who are looked up at by the rest. Guitarist Pigat is one such figure.” - The Province. “Vancouver guitar- wiz Paul Pigat’s rip-snortin’ roots-rock trio is a joy.” - TV Week. 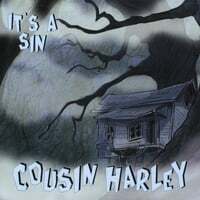 Little Pig Records is pleased to announce the May 18th release of It’s A Sin, the first CD in four years from Vancouver’s Cousin Harley, and touted as the best one yet. With the exception of two obscure covers, the seamless amalgam of rockabilly, surf, spaghetti western themes, Tex-Mex and western swing were all penned by Pigat. wall rock’n’roll all with the volume cranked up to eleven.” said Paul Pigat, front man and guitar player for the band. Pigat’s relentless touring and devotion to this musical language has brought forth an erudite sophistication in his writing that belies his relatively young age. The CD is firmly rooted in the era that Pigat likes the best, a time when guitar virtuosity was taken to a stratospheric level and music lovers expected no less. The seemingly incredible effortlessness that Pigat displays while attacking such complex material is nothing short of astounding. The three piece combo features guitar ace Paul Pigat on vocal and guitar slingin’ duties, crazed upright bass player Keith Picot and noted jazz drummer Jesse Cahill, pounding the rock steady beats. Cousin Harley was featured at the 2009 Viva Las Vegas rockabilly weekender and caused more than a few mouths to gape and eyeballs to pop. I saw these guys live recently and was amazed. Paul Pigat is a jaw-droppingly talented guitarist, and the rest of the band complements him perfectly.